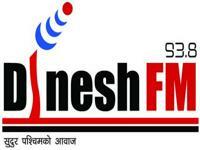 Dinesh FM 93.8MHz is a leading radio media of Far Western Development Region, Nepal. This FM started it’s transmission on 3rd july 2007 and now it is rocking almost all the district of Far West, some district of Mid West including Uttaranchal and Uttarpradesh of India. Dinesh FM 93.8 MHZ is commercial radio media standing on it’s own. Dinesh FM 93.8 MHZ has already started to achieve the professional and economical standards since the date of establishment with it’s perfect program composition and marketing policies, Dinesh FM as a part of DINESH GROUP is dynamically advancing twards progress and development.